Meeting Point: Information Desk (located at Platform 2). Please meet your Golden Tours representative at Information Desk (located at Platform 2),. 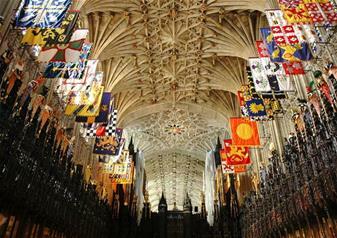 Get return train tickets for an idyllic day trip to the beautiful town of Windsor. With a meet and greet at Paddington Station, London, you’ll get an informative welcome pack and your rail rickets before heading off on your Windsor adventure. Visit the glorious Windsor Castle and discover why it’s widely recognised as the Queen’s favourite royal residence. As exquisite on the outside as it is inside, you’ll get to soak in your picturesque surroundings before heading in to explore the former home of some of Britain’s most famous monarchs of all time. Visit the venue for Prince Harry and Meghan Markle’s wedding, the sensational St George’s Chapel, and see the world-famous Queen Mary’s Dolls’ House. Venture through the exuberant royal State Rooms and enjoy the wonderful architecture throughout – a simply unmissable tour. Top off your Windsor day tour with a Windsor Duck Tour on the river. Gliding past some of Windsor’s most delightful sights, you’ll get to have panoramic views as you sit back and relax. You’ll get to enjoy live commentary as you cruise the waters, with entertaining anecdotes and an abundance of humour from your live guide. Please note that on Friday 22nd March Windsor Castle will be closed. Please get to Paddington Station at 8.50am. Meeting point is Information Desk located near Platform 2. Return London trains are every 20-30 minutes until approximately 10pm.